The SEC’s Claims Review Staff (“CRS”) issued a Preliminary Determination recommending that a culpable SEC whistleblower be granted an SEC whistleblower award. The culpable SEC whistleblower had voluntarily provided original information to the SEC that led to the SEC’s successful enforcement action. The Claims Review Staff’s Preliminary Determination acknowledged that the dollar amount of the award would come to more than $22 million. The whistleblower notified the SEC in writing that he or she would not be challenging the CRS’s Preliminary Determination. The Preliminary Determination was therefore converted into the Claims Review Staff’s Proposed Final Determination. The Commission adopted the Proposed Final Determination and granted the SEC whistleblower reward. The Commission’s Order granting the award to the culpable SEC whistleblower redacted the percentage amount of the award that the Claims Review Staff had recommended in its Preliminary Determination. 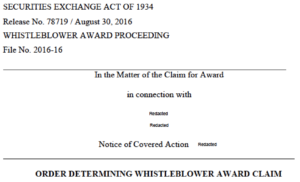 Because the percentage amount of the award was redacted in the Order, it is not possible to determine whether the award was reduced due to the whistleblower’s own culpability and, if so, by what percentage. A footnote in the Order explained that in “determining the appropriate award percentage”, the SEC considered several “factors mitigating the Claimant’s culpability”. One mitigating factor referred to in the Order was that the SEC whistleblower “did not financially benefit from the misconduct”. The Commission’s Order also stated that its determination of the “appropriate” percentage amount of the award was based in part “on the specific facts and circumstances of this case”. The SEC’s press release announcing the $22 million award gave a bit of insight into those facts and circumstances. 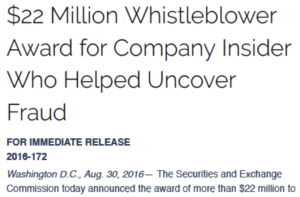 The press release stated that the culpable SEC whistleblower provided the Commission with a “detailed tip” and “extensive assistance”. The whistleblower’s information and assistance helped the SEC to “halt a well-hidden fraud at the company where the whistleblower worked”. The Acting Chief of the SEC’s Office of the Whistleblower went further, explaining in the press release that “Without this whistleblower’s courage, information, and assistance, it would have been extremely difficult for law enforcement to discover this securities fraud on its own”.